How do I upload images to create Posts? 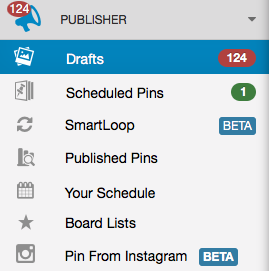 Go to your Drafts Page (located in the lefthand navigation menu). 2. Find the "Create New Pin " button in the upper right. Click it, then select "Upload Images". 3. Select the image(s) you want to upload from your computer's folder system. 4. Once the upload(s) has finished, you'll see the images added to your Drafts to edit and schedule! For faster uploads, we recommend optimizing all image files. The maximum file size is 5MB, but performance can slow down substantially with large image files. You can also just drag and drop images onto your Drafts page. Go on- give it a try! By default, uploaded images will use your domain url from your profile as the Source URL of the Pin for Pinterest publishing. Be sure to edit this if it should point elsewhere. 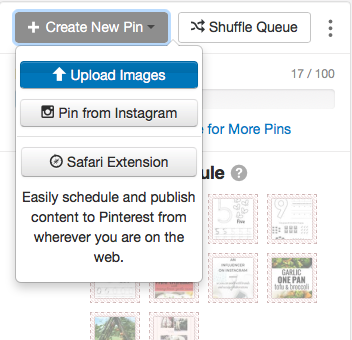 All Pins must have a source URL or Pinterest will reject them.